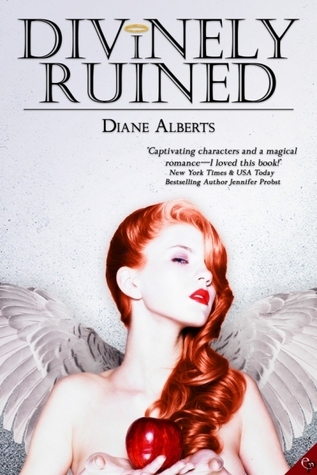 Divinely Ruined by Diane Alberts. Publication : April 26th 2012 by Entangled Publishing. I'm so happy to be a part of The Divinely Ruined blog tour. I'm not usually one for short stories but I read this one and I loved it! Divinely Ruined is funny and sweet with a paranormal twist. You guys definitely want to read this..! Thanks to Diane and Entangled, I've an interview with Diane today, followed by a giveaway of an e-copy of the book. You can read the first chapter for free here : Entangled Publishing. Describe Divinely Ruined in one sentence. A romance book about an angel trying her best to earn her wings, watch her mouth, and keep her hands to herself—all while her subject falls for her more and more. Divinely Ruined is certainly not your first novel, but it is different from the rest of your books, how is that? It introduces a new world where angels are roaming freely and come right up to their charges and announce who—and what—they are. It’s got a lot of laughs, a heck of a lot of attitude, and maybe a few tears along the way. When I originally starting writing the book, I didn’t mean for Rebecca to be so sassy—but she showed me how it was going to go down. And…I listened. Tell us a bit about your protagonists - Rebecca and Tony. Rebecca has a temper to match her hair color, and feels there is no happiness left in the world for her. When an angel approaches her and offers her a position among the elite, she doesn’t hesitate to jump on in with both feet. What she doesn’t expect is for Tony—her first assignment—to be so darn irresistible. Tony had his heart crumbled up into itty bitty pieces by his ex-wife, Jane. She left him and their daughter in the dust, and he’s struggling to make ends meet as a single father. He lost his business, his home…and his faith. Until Rebecca comes and sets him right. What's your favorite kind of romance? Forbidden, Tragic or a Happily Ever After? Can I vote all three, all in one book? I love the “forbidden” love sentiment, and I adore some tragedy in my books. But I must have happily ever after. Not only in the books I write—but in the books I read. I live for the happy ending, where all is right in the world of the book I immersed myself into. There’s too much sadness and devastation in the real world—I like to stick to happy ending in my land of make-believe. What are the 3 things that you can't live without? My family, my kindle, and my iPhone. My family—well, I think that is pretty obvious in and of itself. My kindle—because a girl’s gotta read, right?! My iPhone—because I need to tweet! "I hope you're pleased with yourselves. We could have been all killed -- or worse, expelled." You got yourself a genie and he's granting you one wish - for anything. What would yours be? Okay, I’ll go with more time to write! I have so many ideas dying to get out…but not enough time to get them down on paper! So, I’ll go with that. More hours in a day to get my writing done. Last question - Twitter or Facebook? Twitter—all the way. I’m kinda-sorta obsessed with it, and love posting little snippets of my current writing on there. Also, I love interacting with readers and other authors. That was so much fun, I hope you guys enjoyed it. I love getting to know authors =) Anyway so here's the giveaway, and believe me you want to read this, Rebecca is the coolest badass angel I've come across. Giveaway Prize is an E-Book Copy of Divinely Ruined. I'm in no way responsible to ensure that you get your book, it's the author/publisher's responsibility. Diane Alberts current contracted works with Entangled Publishing are: On One Condition (February 2012, Ever After line), and Divinely Ruined (April 2012, Ever After line). Her current works with Decadent Publishing are: Kill Me Tomorrow (October 2011, 1NightStand series), Reclaimed (December 2011), Absolution (March 2012, Honor Guard series), Broken (March 2012, 1NightStand series), and Escape To Me (TBA, 1NightStand series). Diane Alberts has always been a dreamer and had a vivid imagination, but it wasn’t until 2011 that she put her pen where her brain was, and became a published author. Since receiving her first contract offer, she has yet to stop writing. Though she lives in the mountains, she really wishes she was surrounded by a hot, sunny beach with crystal clear water. She lives in Northeast Pennsylvania with her four kids, a husband, a bird named Nemo, and two clown fish named Blue and Jewel. In the rare moments when she’s not writing, she can usually be found hunched over one knitting project or another. 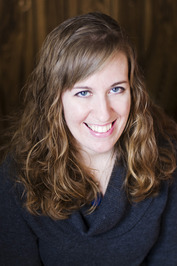 She is a multi-published, bestselling author with Entangled Publishing and Decadent Publishing. She is repped by her fabulous agent, Lauren Hammond of ADA Management. She has, as of this date, two books contracted with Entangled Publishing, and five books with Decadent Publishing. Her February release with Entangled Publishing, ON ONE CONDITION, hit #18 on the Barnes and Noble Bestseller List. She has a lot of projects currently being shopped around by her fabulous agent, and her goal is to write so many fantastic books that even a non-romance book fan will know her name. The cover caught my eye. I like the bright hair against the pale backdrop. It makes her stand out. I love that part about it, too! My 2 favorite things! Paranormal and Romance! They do go together oh-so-well, like peanut butter and chocolate. ...and now I want Reesee's. It's great to meet you, Diane. The premise sounds wonderful. Many congrats!! The interview was really interesting! I really would like to read the book as I've never read something about angels. I loved the quote from Harry Potter, Hermione was one of my favourite characters! The picture on the cover really shows the sassy character of Rebecca. Diane describes it so well in her interview. Sounds like a book with some new elements, the angels that explain themselves to their charges. I would love to win it! Thanks for the chance! In general I'm not a lover of short stories but if it's a new author for me, than it's an excellent way to test drive a new author. Gotta say, awesome cover! I love the apple. As a symbol of her fall from grace. Thank you! I love the cover, too! Thanks for the great giveaway and interview. Twitter rules:) The cover art is soft, even with her red hair and the apple. It blends well and looks genuine. As for short stories, I love them. Also love reviewing them. Short stories and collections are a challenge to review without spoilers and I love it. Yes great interview and I do love short stories but sometimes it makes me sad when its the case of an ended series but the author does a short story and makes you want more books to that series. Ooh, nice cover and Paranormal romance, I'm all for it.